World War II had dramatically changed Alaska. Between 1939 and 1945, the population had doubled as large military installations were built and provisioned. As the end of the war drew near, the territorial economy boomed with federal spending; however, this did not translate into significantly increased revenue for the territorial government. Therefore, although the cost of the general operations bill increased substantially to roughly $5.63 million, or about 30 percent over the previous biennial budget, that increase was less than what one might expect given population increases. Further, this budget needed to cover the costs of the newly formed Departments of Agriculture, Health, Labor, and Taxation. To help cover these costs, the Legislature adopted a one cent per gallon tax on motor fuel and increased alcohol taxes. In addition to the new departments mentioned above, the Alaska Housing Authority (AHA) was created to clear blighted housing areas, provide public housing, and address chronic housing shortages for the many soldiers and their families who, once stationed in the Territory during the war, wished to stay. Decades later, after undergoing a number of name and mission changes, the AHA ultimately became the Alaska Housing Finance Corporation, which provides numerous housing-related services, particularly to low and moderate income residents, and today contributes dividends to the state general fund worth tens of millions of dollars per year. The 17th Territorial Legislature sought to expand and protect rights. First, it granted to Alaskans aged 18 and over the right to vote. Until the 1971 approval of the 26th Amendment to the U.S. Constitution, the federal voting age was 21, and only a few states allowed anyone younger to vote in state elections. (Territorial Alaskans were still unable to cast votes for federal offices or even for their own governor.) 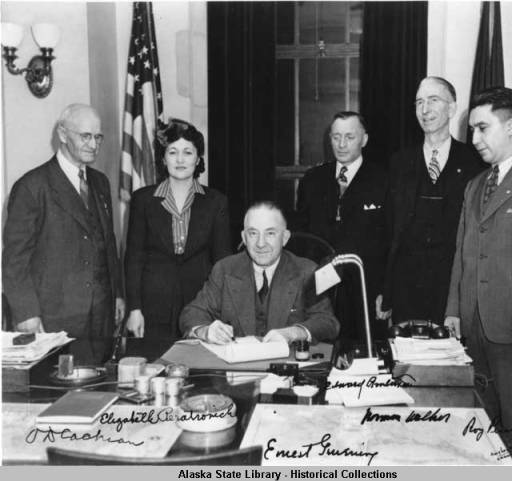 Second, following dramatic and highly regarded testimony by Elizabeth Peratrovich, a Tlingit woman hailing from Petersburg, Alaska became the first state or U.S. possession to pass a broad anti-discrimination law nearly two decades before passage of the federal Civil Rights Act of 1964. Under the Alaska law, anyone discriminating based on race, or posting signs that sought to enforce separate accommodations based on race, became subject to punishment of up to 30 days in jail and/or a $250 fine. The first Teachers Retirement System was established to provide a pension of $1,200 to retirees aged at least 55 years with 25 years of teaching service, 15 of which had to be in Alaska. Adjusted for inflation, that pension would equate to about $15,000 per year in 2012 dollars. The new system also put in place a mandatory retirement age of 60 for teachers. The periodic push for statehood continued with this Legislature, which voted to place the question before the voters in the 1946 election. Alaskans voted in favor of statehood by a margin of 9,630 in favor to 6,822 opposed. Unfortunately, Congress would fail to agree for some years to come. The bombing of Dresden, Battle of Berlin, and the destruction of Hiroshima and Nagasaki by atomic bombs bring World War II to an end. Europe is divided between the West and the Soviets. The United Nations is established. The first pictures of Earth from space are taken.